Great value – large 4 ½ oz (combined weight) epoxy. This is the quick grab, quick cure and is a MUST for any workshop or flight box or pit box. 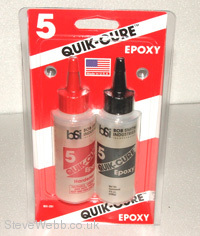 5 minute Quik- Cure epoxy from Bob Smith Industries – At Steve Webb Models and ServoShop!